... Microprocessor control. 3. Electric lid lock, over speed, over temperature and imbalance protection. 4. Stainless steel centrifugal chamber and lid. ... quickly. 3. Automatically electric lid lock, over speed, over temperature and imbalance protection. 4. Stainless steel centrifugal chamber and lid. Application: BK-L5KSII is an ideal separation equipment of water test and sediment content in crude oil at oil industry and research institutions. A laboratory centrifuge can separate a solution into its various components because of their varying densities. These devices are indispensable tools for basic laboratory operations in biochemistry, bacteriology, hematology and serology. 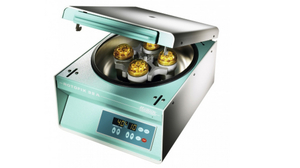 When separating a mixture containing solid and liquid components, the centrifuge includes a container whose apertures are large enough to allow the liquid to pass through but small enough to keep the solid from escaping. Rotational force is created by a motor driving a rotor or by a hand crank and a gearing system. The higher the rotational speed, the more efficient the separation. Choice will depend on the machine's rotational speed and the mixtures and solutions to be treated, including urine, stool and blood, and the types of analyses to be performed. Sample type will influence tube selection. Centrifuge capacity in terms of samples treated per hour is another factor to consider. The system required for fastening the unit to the lab table and operating noise level also should be taken into account. Rotor configuration must be suitable for the types of tubes to be centrifuged.